The formation of organizations that are international from inception—international new ventures—is an increasingly important phenomenon that is incongruent with traditionally expected characteristics of multinational enterprises. 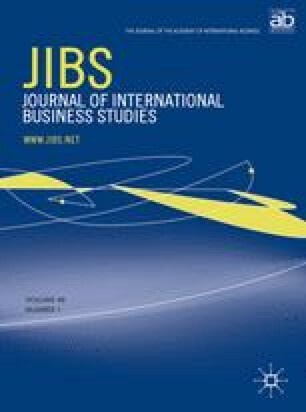 A framework is presented that explains the phenomenon by integrating international business, entrepreneurship, and strategic management theory. That framework describes four necessary and sufficient elements for the existence of international new ventures: (1) organizational formation through internalization of some transactions, (2) strong reliance on alternative governance structures to access resources, (3) establishment of foreign location advantages, and (4) control over unique resources. *Benjamin M. Oviatt is Assistant Professor of Management at Georgia State University. He received his Ph.D. in strategic management from the University of South Carolina. His research focuses on strategic management, organizational turnaround, and international new ventures. **Patricia Phillips McDougall is Associate Professor of Strategic Management at Georgia Institute of Technology. She received her Ph.D. in strategic management from the University of South Carolina. Her research focuses primarily on new and young firms, with a special emphasis on strategies and internationalization.